This entry was posted in Crowdfunding on September 16, 2013 by Jan.
Update: A huge thanks to Ingix and Tomas for spotting an arithmetic problem! All calculations and excel file have been updated to reflect the correct math. Now the only small differences should be the insignificant rounding errors. Also please keep in mind that this simplified way doesn’t count with eg. employee deduction. So if you count with employee rate, you have to put in the full figure! Creating games is expensive. Today I’d like to invite you behind the scenes of my thought process when coming up with the realistic target for our IndieGoGo campaign. While it looked easy at first, as soon as I approached the problem, it became obvious that there were way too many variables to guarantee an easy path. Please note: this post is mostly centered on boring numbers and some elementary math. You have been warned! In my case, I started from the economic side of things. Even if I had neat and finalized budgets for our pitches to various publishers for full games, immediately I recognized that it is way out of our league for crowdfunding. Instead I came up with the idea of enhancing a game which was already finished. This way the necessary investment wouldn’t be too big. But I still had to figure out how much money we needed. Instead of guesswork, I decided to simplify my life by doing some rough calculations. We are a two-man team, so let’s try the idea of a small expansion which would be possible to complete in 3 months. I knew that we wouldn’t be able to cover our full-time expenses and the budget would have to be very modest. But even then we can’t go under $800 / per man-month. Basically, two people working three months for $800 need $4,800 just for the basic production. With J.U.L.I.A. we already had all the tools on hand so luckily we didn’t need any additional licenses. Still we needed the game to be proofread / text edited and to pay voice actors. At minimum we are going to need $1.500 for additional costs. To sum it up: the original production sum was $6.300! And, sadly, that’s far from finished. As soon as you reach your target, you have to forget about roughly 9.1% of your incomes. 4% takes IndieGoGo and 5.1% takes PayPal (PayPal is unpredictable because it charges different percentage based upon the country of the pledger!). As if this was not enough, you also need to calculate VAT. In our country VAT is a hefty sum of 21%. Even if you might have heard otherwise, as soon as you start digging deeper, you usually find out you must pay VAT (even if it has me tearing my hair off). As if this was not enough, you pay both VAT and the IGG/PayPal from the total sum. This means, that from our original $6.300 we would get only $4.592. These aren’t numbers I came up with, but the result of consulting with a tax expert and independently verified with other tax experts as the VAT was hard to swallow. Not only that, but even if you are NOT a VAT payer, the first pledge from within the EU will make you one. The bottom line is that before you go and start crowdfunding, check with your local tax expert to understand the impact of taxes in your country. Common sense doesn’t apply when it comes to taxes and your country will want to rob you as much as possible. Unfortunately no… There are those pledge rewards and other than the digital-only tiers, they are going to cost us extra money AND shipping and handling. While I will be devoting an entire section of this blog in the future to these, for now, let me just say that you roughly need to count on 15% of the originally pledged money to cover these incentives. 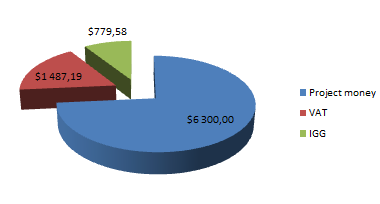 I came up with this number by making an approximation of similar projects and asking around about production costs. As it was fairly complex procedure, take it as a face value (I won’t bore you with statistics in here) and let’s plug it into our bloated formula! No way can we start that high of a funding goal on IGG. As I’ve already stated in my first post, we were not well known and didn’t have much of a fan base. I still wanted our crowdfunding campaign to be a success story, so I came up with the idea to strip our project goals down to a more modest but still substantial enhancement. I’ve set myself a limit of $5,000 and using my calculations I’ve already known, that I was going to have roughly $2,927 for a production. This will leave me with 2.5 months of one person (Lukáš, who does the visuals) and $927 for additional costs needed to finish the product. I’ve decided to do this enhancement for free with a vision to get my investment back from the finished product sales. The rest of the tasks I chose to enhance were script/programming/music/sfx. These I am doing myself so no direct investment of backers’ money is needed. Also I have to to cover some of the aforementioned direct expenses and this money split could just barely work. In case you still think that crowdfunding is a good idea, I’ve created an Excel spreadsheet for you, which helps you calculate some rough numbers. I’ve preset the values for a small dummy project just to show you h0w it can be used. Of course in reality you are going to add another people to the team like Game Designer, Writer and so on and also modify their salaries! You might also want to put in office rent, website hosting costs etc. This is just to demonstrate how the IGG calculator works. You can download the file here and use it entirely on your own risk! In this chapter I’ve tried to draw you into my thought process of coming up with a realistic numbers for a crowdfunding campaign. Next time we are going to look into pledges and pledge rewards. Thank you so much for reading my post and your comments and suggestions are extremely welcome! I’m sure that your spreadsheet could help prevent more than one project from ending with egg on their faces due to overly optimistic cost estimates. Your nation’s VAT is a hefty chunk- ouch! Also, this is interesting to read and then go back over your reaction to us reaching the different funding levels. Thank you so much. While each country has a different tax rules, understanding that there might be some serious pitfalls can really help. Moreover VAT is not obvious and my friend actually got into a serious problem as he didn’t know about that VAT rule (mere 1 payment from EU makes you automatically a VAT payer). Finally he paid an incredible amount of money as a fine. What is this total sum compared to an AAA project? I mean this is not big money in terms of game development. 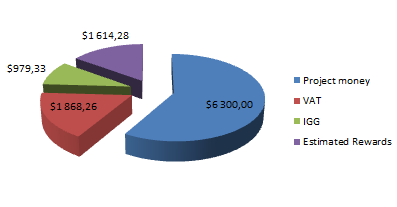 Also you have to calculate marketing budget which could easily be the same amount of the basic budget. Or you bring up a great viral video if the game is unique and then you don’t need that much money…But mostly the marketing budget is something to be taken seriously. Marcel, thank you for your comment and you are of course right that marketing can get very expensive part of the process as well as other things I didn’t mention because the point of this article was not about putting together a budget for a game – it would have been quite a different post – but rather about understanding what can you expect from crowdfunding. It’s really easy to add all costs together and set a target to $3,000,000 but unless your name is Tim Schafer or Brian Fargo, you won’t probably succeed – especially on IndieGogo. Also I can’t see much of a reason why to compare small 2-men indie project to AAA production. AAA production usually starts at 50 millions of dollars. However if you are referring to my IGG calculator, you can simply add a line with any kind of cost you need. I’ve basically put a few lines everywhere to show where which kind of information has to go. 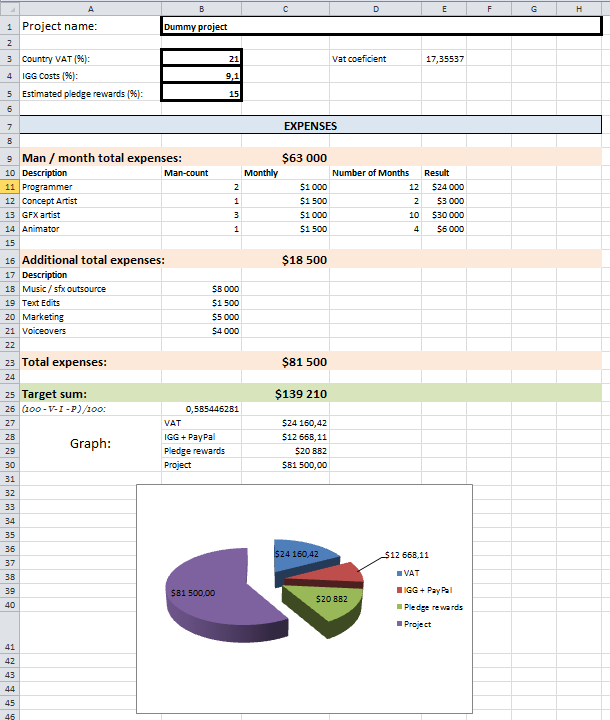 It’s not a real budget as I’ve hinted just above the excel snapshot. Marcel, I see your point now and it’s a very good one! However, there is always an option not to calculate marketing at all and simply take the finished product to a reliable publisher who would handle marketing for you (look at all the big guys who does just that). My own approach is to finance marketing costs from entirely different source and thus not clutter crowdfunding with this. The sad state of a current crowdfunding is that after some scams or huge under-deliveries, people are getting more cautious where they put their money. The situation when everyone dreamt that for $100k you get the perfect game is over. But you have to count with much less money now, as well. Disclaimer: This is based on handlings in Germany, but I assume that basic idea is the same in Czech Republic. I’m also not a tax expert, just a simple mathematician. If you want to sell something for 100 € without VAT, but must pay VAT (21%) to your country, you have to sell it for 121 € (100€ + 21% of that). So from the amount you get from the costumer (121€) you have to pay 21€ taxes, keeping 100€ as planned. This means you get to keep 100€/121€ = 82.6% of your income, slightly more than the 79% you used. This doesn’t change the underlying idea, but makes for a slightly different numbers. Ingix, thank you for your comment. However I belive (and correct me if I am wrong) that yours is a different case and my calculation is correct. My reasoning is that I have to count the total value which means that for me the pledged amount is WITH VAT already (otherwise I won’t have necessary funds to cover it). Ingix, Tomas – thank you! I’ve finally understand I really made a mistake there. Repairing now. I’ll credit you both. Thank you so much for this post, its very useful! Most of what you say is also valid for Kickstarter projects too. I tried some wild calculations, but on the marketing side: http://designagame.eu/2013/09/fermi-estimates-crowd-funding/ . Let me know what you think! Pietro, thank you for your opinion article! I’ve enjoyed reading it although being brutally honest, this kind of prediction is nice as a theory, but in my experience the campaign is a living and breathing organism which you have to keep alive and in turn it rewards you with an incredible level of unpredictability. For me it resembles more Mandelbrot set than a Fermi problem. One example for all – we’ve been “a featured campaign” for a week, having J.U.L.I.A. on IGG front page and it has next to no impact on the pledges. But I will come to this in upcoming parts of the series. How far are you with your campaign? And have you known that a new chapter is out?